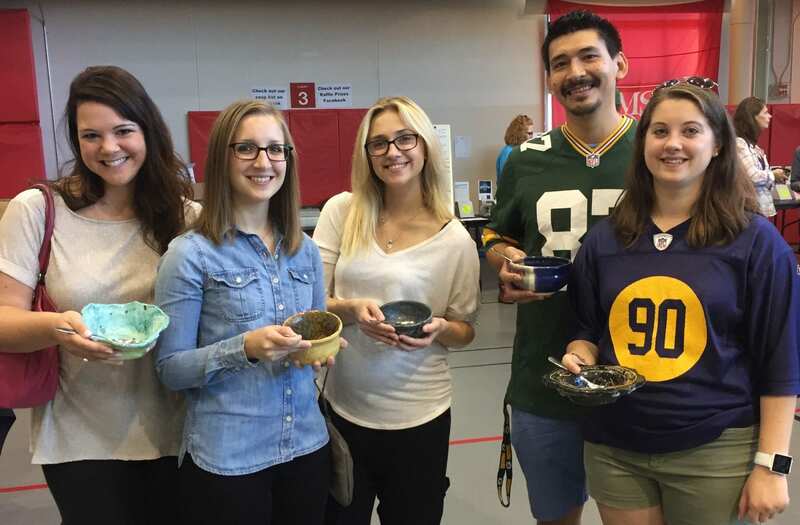 Earlier this month, a number of Top Floor employees participated in the 19th annual Milwaukee Empty Bowls charity event at the MSOE Kern Center. Empty Bowls is an event that raises awareness for the less fortunate who go hungry throughout the city of Milwaukee. The money raised from the event benefits food pantries and meal programs such as: The Gathering, Guest House Of Milwaukee, and Repairers Of The Breach, amongst others. This year alone, nearly $64,000 was donated, and Top Floor was proud to take part in the cause. The concept behind the event is actually very unique. In return for each donation, you get to pick out a hand-made bowl to take home with you! But, not before eating some delicious soup and bread out of it while mingling and listening to live music. Each year, grade schools, high schools, and college students, as well as church groups, scouts, and even nursing homes donate hundreds of one-of-a-kind bowls. Once you enter the room of tables filled edge to edge with beautiful bowls you must scour the lot in search of your favorite one. But with so many choices, it’s hard to settle on just one! If you prefer the “surprise me!” route, you can go to the table of bowls that are wrapped in brown paper to choose from, if making hard decisions just isn’t your cup of tea. Once you pay for your bowl (which is your $25 donation) you’ll receive 2 soup tickets, and go onto the washing station, where several volunteers will hand-wash your bowl, getting it ready for the second best part of the event – the soup! As you enter the gymnasium, you’ll see over 30 soup vendor tables outlining the perimeters of the space. With your 2 soup tickets in hand, you can fill up your bowl twice with different soups to try. Some of the restaurants that had donated include: Cafe Corazon, Story Hill BKC, Hue Vietnamese, Comet Cafe, and Beans & Barley. If you’d like to try more, additional soup tickets are $2 each. 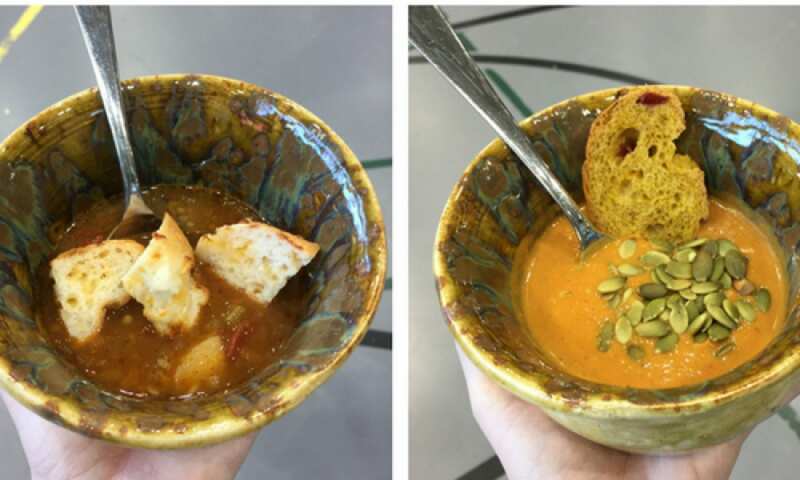 Don’t forget bread with your soup, donated by City Market, Molly’s Gluten Free Bakery, and Troubadour Bakery! As you enjoy your meal and mingle with the community, live music will be playing in the background by featured Milwaukee artists such as, Michael Henszey, Layers & Layers, and Micah Olsan. Once you’re finished, the great volunteers will wash your bowl, and wrap it up to take home. It’s astonishing to see how packed the gym consistently stays for all 3 hours of the event. It really is a testament to how many people in the city of Milwaukee care, to give up an hour or two of their Sunday afternoon to make a difference for a great cause. To learn more about this event or volunteer, please visit http://www.milwaukeeemptybowls.org.